An anonymous comment reposted by Irene Kelly in Facebook revealing something 'private' issue for Valenciano family. The open letter was all about the "mistake" done 30 years ago in connection with the past of Gab V's parents. It all started with Gab V's thoughts about the morality of the Davao City Mayor Rodrigo Duterte. Until this comment by an anonymous person appeared and told to Gab, "Your father was not as clean either"
"Your own father had a girlfriend and at 19 years of age, he got another girl pregnant whilst still in another relationship,” the letter started. “That other girl is your mom. His girlfriend was Felichi Pangilinan, your mom’s younger sister. So stop talking about womanizing, values, morality, and loyalty when your own parents did not exactly do the right thing either." "How come you never condemned your parents? And by the way, that child who was conceived out of indiscretion is you (not that it's your fault)." The writer's letter says, "I am not supporting any candidate nor am I condoning infidelity but look within your own family before becoming too opinionated and judgmental about someone else’s life. This is not about politics. Don’t tackle an issue that once hounded your own family. Yours is not perfect either." 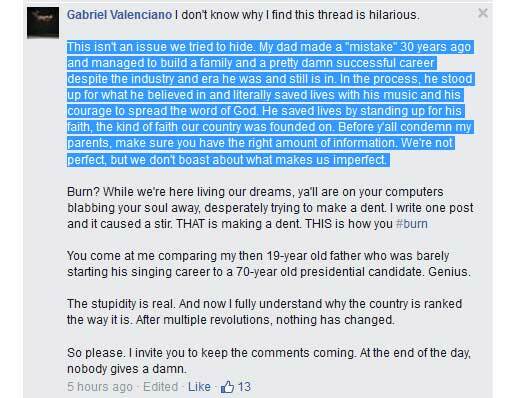 At the bottom of the said letter writer told to Gab that people who don’t condemn his father Gary V. from his mistake but instead admire him for his work. "By the way, I like Gary V because he is a good singer and not because he was a womanizer,” the write said. “A lot of people support and admire Gary because of his talent. They did not judge his faults. Look the story up on Google and on YouTube (Angeli and Felichi opened up about it on the 700 Club show)." 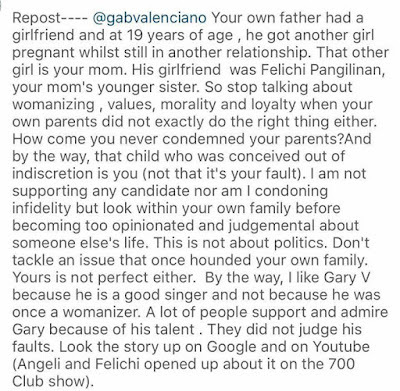 According to Gab V., they are not hiding the issue about his father and that's not the issue. He explained his side on the comment section of the repost image of open letter to Gab. "This isn't an issue we tried to hide. My dad made a "mistake" 30 years ago and managed to build a family and a pretty damn successful career despite the industry and era he was and still is in. In the process, he stood up for what he believed in and literally saved lives with his music and his courage to spread the word of God." Gab added, "He saved lives by standing up for his faith, the kind of faith our country was founded on. Before y'all condemn my parents, make sure you have the right amount of information. We're not perfect, but we don't boast about what makes us imperfect. " 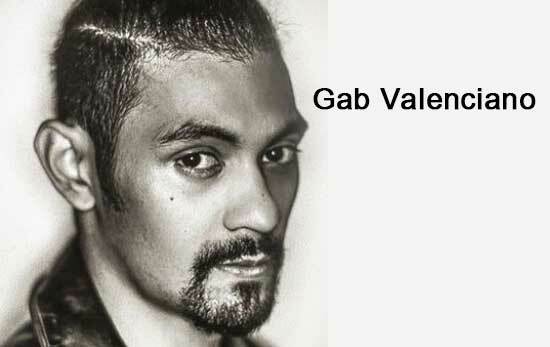 Comments or suggestions about "Anonymous commented to Gab Valenciano's thought about Duterte's morality" is important to us, you may share it by using the comment box below.